Today felt like a busy day, though most of it was sitting down. It began with cats - of course. 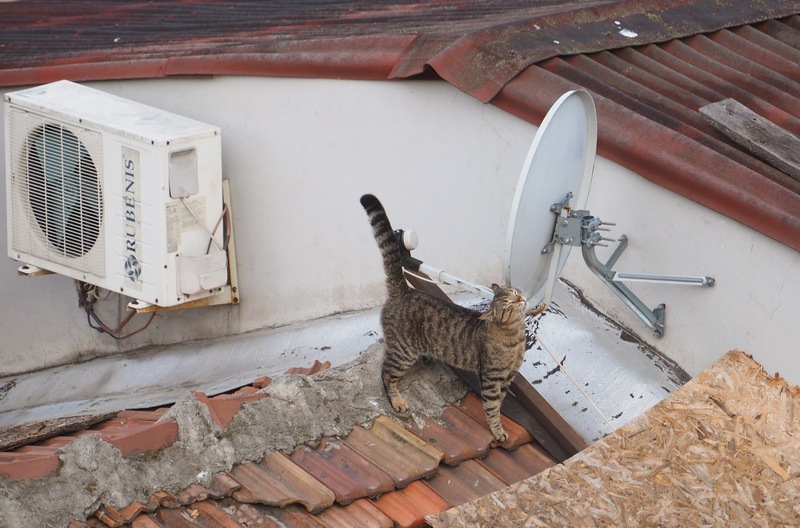 Istanbul has more cats than the internet, apparently stray but happily mostly well-fed even so, and the first of the day were taking the air on the roof below our hotel balcony. We could see too that it was a clear day so we set off down to the river, ploughing through flocks of pigeons (also fed) and marching down Istiklal Caddesi which was still waking up. The fishermen were already in place on Galata Bridge, though, rhythmically dipping and raising their rods as ferries bustled about on the water beneath. 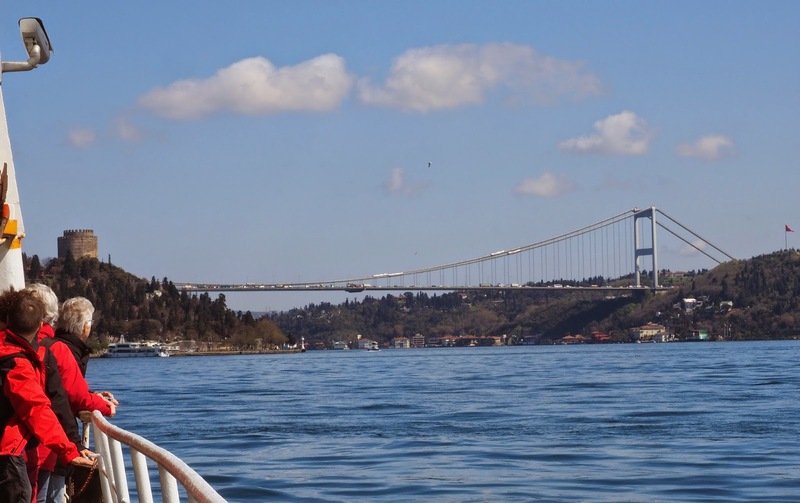 That was our aim: a big ferry that took us down the Golden Horn and into the Bosphorus, and all the way up to the Black Sea. There was nothing fancy about it (and especially the loo, the first squatter of the trip) but it was very pleasant to sit outside and watch the scenery pass by: two huge modern bridges, elegant seaside residences, mosques, palaces, universities, a castle and small fishing ports lined with waterfront restaurants. That was where we ate, on the Asian side, an unexciting meal in a pretty location over the water, cats prowling beneath the table and perfectly happy to be offered peppery shrimp. There were lots of stray dogs here too, again mostly well-fed, and two of them went bounding through a soap-opera scene being filmed in one of the narrow, unsealed streets - an old man in bandages chewing the scenery, waving his crutch in the air to the great amusement of all the tourists and townspeople watching from behind the cameras. It must have been a novelty for the locals to have a diversion from their sole occupation, of trying to snag their share of the daily tourist tide arriving at lunchtime. On the way back there were dolphins, gulls and millions of jellyfish, waterfronts crowded with people - on a Monday afternoon! - and cruise liners moored near Galata Bridge, totally out of scale. 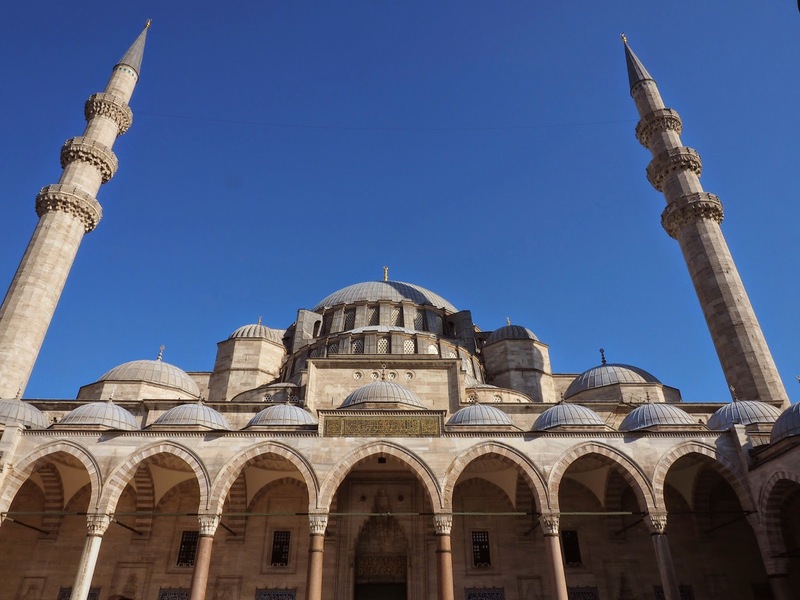 We walked up to Suleyman Mosque to admire its slender minarets and fringe of bright tulips (Holland got them from here, you know) and its wide view over the city and the Golden Horn. Then we went to find a street recommended by the NY Times as Istanbul's best, and found that though it looked French, straddled by an aqueduct and skirting a square lined with severely pollarded trees, it was definitely Turkey: lots of butchers selling lamb intestines, goat heads, hearts and other bits, as well as sacks of spices, nuts and dried fruits. Colourful, and a bit smelly. In this city of 14 million, the public transport seems to work well, and we took the tram to the Blue Mosque which is, confusingly, not blue at all - on the outside, anyway. We couldn't go in because I'd forgotten my headscarf. Next time. 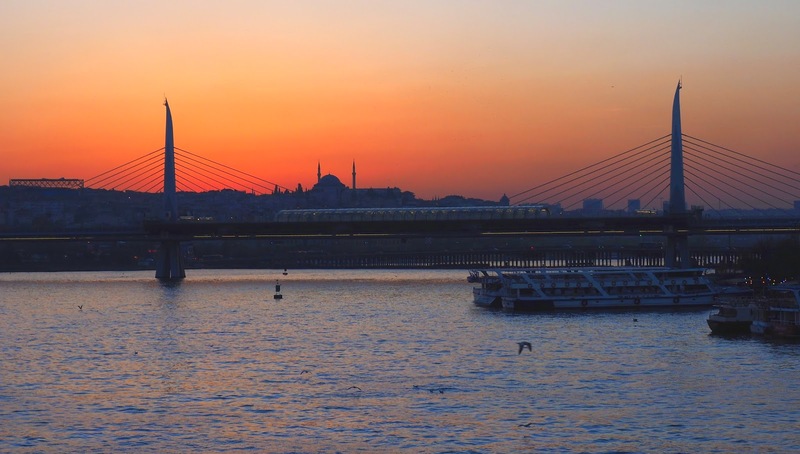 So we ate early, yummy stuffed pancakes and rosehip tea, and then I raced to catch the sunset from Galata Bridge behind a stylish modern bridge and yet another big mosque, while the fishermen dipped and raised, dipped and raised. 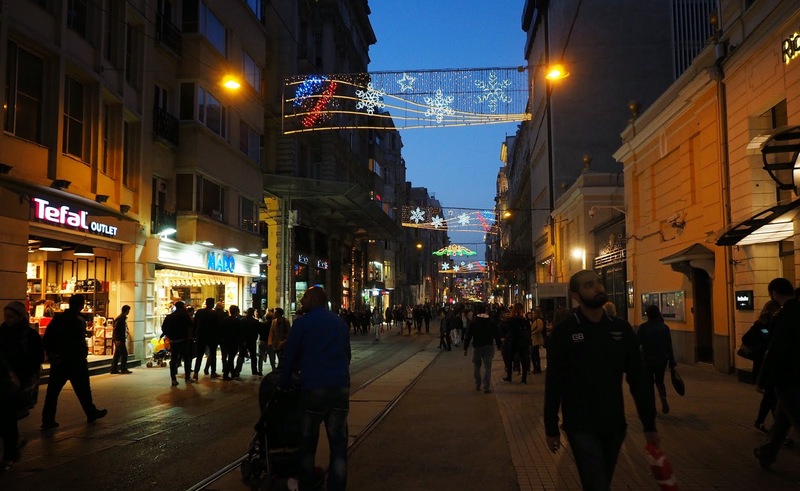 The walk back up Istiklal was entertaining: the crowds were out in force again, the Tower was floodlit, there were lots of buskers including one playing what looked like bagpipes made from a camel's hump, the old tram was trundling up and down, the Christmas (?) lights were hanging overhead, everyone seemed cheerful and friendly. And people were feeding the cats. Hungary for salted caramel icecream?